If you are like me, you love sugar. I love doughnuts, chocolate, pies, cakes, ice cream – practically anything with a high amount of sugar. I had a sugar addiction. Everyone knows you can’t really lose weight and eat the loads of sugar you’ve been eating, so here’s how to beat your sugar addiction. I dramatically reduced my sugar intake and will never look back. Sure, I have the occasional sugar loaded item, but I am ever so careful as I do not want to awake the sleeping giant, the sugar addiction. I will give you my tips for enjoying the occasional sugar treat AFTER you have the addiction under control. When I decided to change my eating habits, sugar was the hardest. I had made significant progress in my weight loss and fitness level but had hit a plateau. After thinking about my habits, I realized the sugar I continued to eat was defeating my healthy lifestyle efforts. It was then I made the decision to work harder to reduce the sugar. Sugar aids in the storage of fat! I am not going to bore you with the details of the science behind how sugar is stored as fat (you can read more here if you’d like), but simply put, when we consume a lot of sugar (more than 6 teaspoons daily) the liver metabolizes the sugar into fat. In fact, investigations have found that the sugar industry paid to have the harmful affects sugar causes hidden. Breaking the sugar addiction really was the hardest habit I had to change. When I say I was a sugar addict, I truly lived off of sugar. There were and are still things I do to help me avoid eating more than I should. Brush teeth often – you can trick your brain by brushing your teeth when you are fighting the craving! 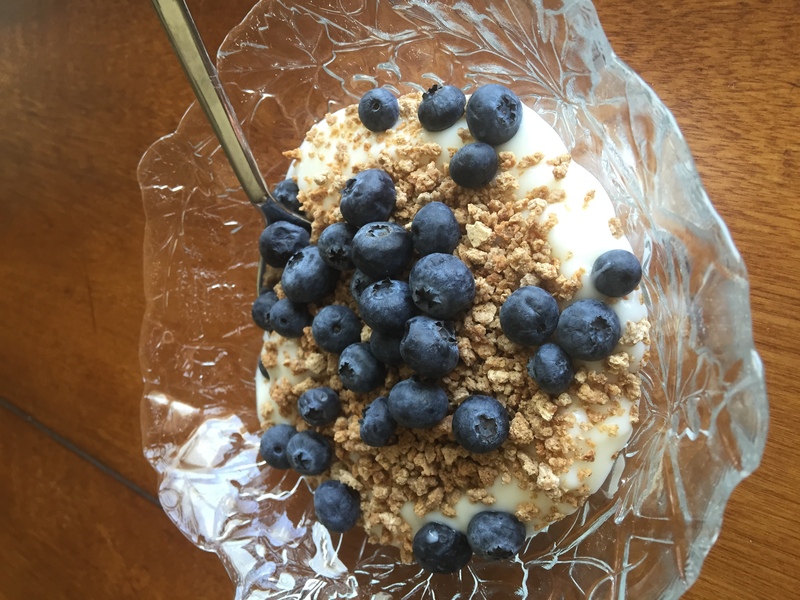 One of my favorite snacks to eat when I crave my evening ice cream is light yogurt or greek yogurt, 1/3 cup grape nuts and fruit – my favorite are blueberries. Once you are able to reduce the amount of sugar in your diet regularly, your taste will adjust. Now, if I eat something with an excessive amount of sugar it is too sweet for me. I recently ate some regular peanut butter and it tasted like I had just put a spoonful of sugar into my mouth – it was awful! I could have jumped for joy! I knew I had crossed a threshold! I’ve struggled with sugar for years, the addiction comes and goes. What do you think of stevia? I know it’s all the rage right now, but is it a problem to substitute sugar with stevia? Thanks, that was a great question! I broke my sugar habit about 15 years ago, when I was diagnosed with tons of food allergies, sugar being one of them. That diagnosis alone was a huge motivating factor for me cut it OUT cold turkey! Well, that will certainly help break the habit! Good that you were able to know what your allergies were. Thanks for sharing! Awesome post, I have been trying to kick this habit for a few years. I do well for awhile and then fall of the wagon :/ That yogurt looks delish..thanks for the tips! Oh what I wouldn’t do to be able to eat my favorite sugar items everyday and not feel the effects! I’m having Yoplait’s Light Pumpkin Pie right now….YUMMM! If you love pumpkin pie, give this a try. I could be eating a slice of pie right now the taste is so on point. Give it a try and let me know how you liked it! Great tips! I do the same thing with greek yogurt! So yummy! Stay on track! Great job 🙂 !! Oh yes, definitely! I can only do Greek yogurt occasionally though, some is just a bit too thick for me. What is your favorite brand? Thanks! Thanks for sharing Stephanie! I’ve just made it through day four of no sugar, well nothing at all that’s processed. It’s been so much easier than I thought it would be. I’d love to know your thoughts on natural sugars in fruits. Can you still get cravings and headaches etc from too much natural sugar? That’s awesome, Sarah! As I said in my post, I know first hand how difficult it is to cut our processed sugar. I have never read (nor experienced it myself) about getting sugar headaches from natural sugars. I still have cravings for “something sweet” from time to time – although it is not after every meal as it once was – but fruits, yogurts, healthier things usually satisfy me. Also, I have whey protein shakes after my workouts, and meal replacement shakes about once a day – usually chocolate flavored and they are as good as a desert to me now. Thanks for the comment! Keep in touch! Stephanie, that is exactly where I am right now….craving something sweet After Every Meal and no power to resist!!!! Vickie, I certainly feel your pain. Not as badly now, oh but when I do…it’s tough! Go over to my post “How to Lose Weight Before Summer Vacation” and print the 7 Reasons to Eat Healthier. Also, have you tried brushing your teeth after meals? It works! Then, go get busy with something and stay out of the kitchen. Eating refined sugars really demolishes our exercise and weight loss efforts so badly. I call eating sweets, feeding my fat cells – so I really try to avoid it as much as possible. Also, if you still can’t beat it, replace refined sugars with a piece of fruit. Good luck! This is a great post. I’ve been struggling to cut sugar out of my daily food intake. I love sweets. I will try these tips. Laura, It is definitely a tough one to beat. Stay consistent with your efforts and it will happen! Good luck and let me know how it goes! Oh yeah, I have family members (no names here, haha) who could definitely do the same thing – easily drink a 12 pack of soda a day. I’m sure you realize this, but try to remember those are definitely empty calories you are taking in. Have you tried the individual flavor packets to add to water? Maybe that would be a good transition for you. Some of them even have caffeine, so the withdrawals from lack of caffeine could be gradual also. Have you joined our FB group? The ladies there are a tremendous cheering team for support through the ups and downs of losing weight.